Today, April 22, is Earth Day! There are lots of silly and not-very-environmental ways to celebrate it (buying grass-scented perfume does NOT count for much, people!). Please, don't get distracted by the commercialism or turn cynical about phonies jumping on the green bandwagon. Just sort through all the options available to you and, starting today, try just one more thing to help the Earth. 1. In 12-inch skillet, heat oil over medium-high heat. Add onion and cook 5 minutes or until lightly browned, stirring frequently. Stir in garlic, curry powder, and cumin, and cook 30 seconds, stirring. Add beans, tomatoes, broth, and carrots; heat to boiling. Reduce heat to medium; cover skillet and cook 5 minutes. 2. Meanwhile, prepare couscous as label directs. 3. Into bean mixture in skillet, stir zucchini and raisins; cover and cook 5 minutes or until zucchini is tender, stirring occasionally. 4. To serve, fluff couscous with two forks. Divide couscous among 4 large shallow bowls. 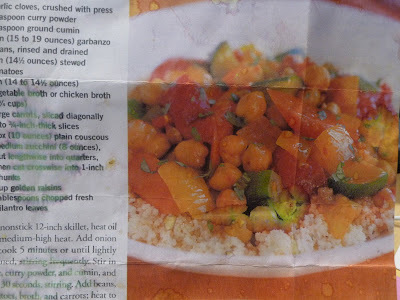 Spoon vegetable stew over couscous; sprinkle with chopped cilantro. This recipe (which I clipped out of some magazine, I forget which) is very flexible. Instead of zucchini you can use asparagus or green beans. If you have cauliflower, you can break it into florets and add them in at the same time as the carrots. Instead of Parmeggiano-Reggiano, you can use Parmesan or goat cheese. If you don't like cilantro, try regular parsley. Or don't bother if you don't have it in the fridge.